A healthy and delicious main dish that will fill you up with vitality. Easy and quick to prepare, it’s the perfect dish for a dinner party and great to share with friends and family. Remove the skin from the salmon and check for bones. Cut into small cubes. Put in a bowl. Finely dice the onion and avocado. Peel, remove skin and finely dice it. Put everything in the bowl. 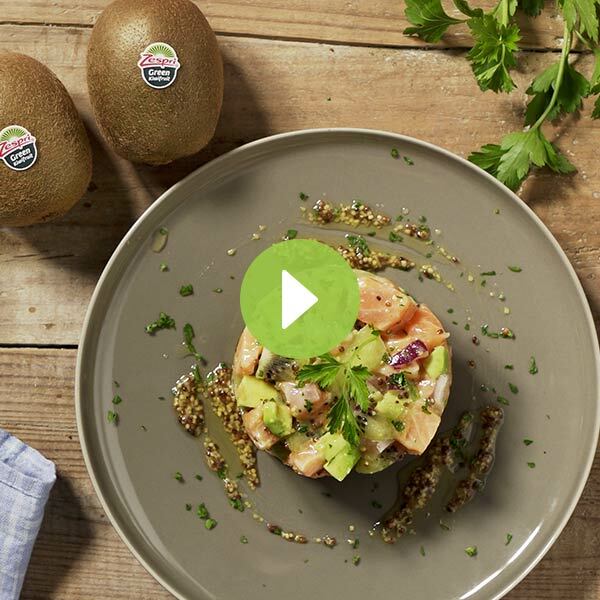 Peel and dice the Zespri kiwifruit, then add to the bowl. Chop the coriander and combine everything. In a different bowl, put the 3 tablespoons of oil, mustard, pinch of salt and juice of half a lemon. Mix well. Pour the mixture onto the salmon, kiwifruit and avocado. Stir carefully to prevent the ingredients from getting mushy and so it looks as attractive as possible. Put a plating ring on a plate and fill it halfway with the mixture. Repeat with another plate. Decorate with a little coriander and serve. What foods should you be including in your diet if you are keeping an eye on your weight? Keep reading for some handy hints!